Connecticut rockers Talking To Walls will be unleashing their new record, We Were Not So Tall soon! It'll be released on March 30 to the world at large. 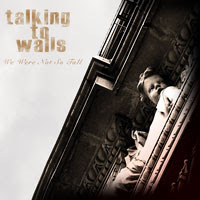 But, if you pre-order the record directly from the bands website, www.talkingtowalls.com, before Tuesday, February 16, you get to be among those that experience the records early release. Plus, you'll get a little extra something. Say wha? Good music and goodies?! Well dang wow! I've had the chance to hear most of the songs from the record live. The songs are good and you're gonna enjoy the record. So, what are you waiting for? Go ahead order it. Valentine's Day is right around the corner. Imagine your sweethearts surprise when you say, "honey, I ordered you the new Talking To Walls record" ... guaranteed lovin'! Okay, maybe not, but you'll have the bands appreciation.